Several years ago I got into an argument before traveling with some girlfriends. They wanted to carry on their luggage. I believe in checking luggage. I firmly believe that checking luggage is a service that is provided for you (and this is before they started to charge). Why would I, schlep my luggage through the airport, rush to the beginning of the boarding line to ensure I was on first, to reserve space in the shoebox of an overhead compartment, hoist the bag over my head into an already jam packed bread box, and then risk life and limb to take my bag out again after the plane has landed and items have clearly shifted during the turbulent flight, and then drag it into the restroom because I hate airplane bathrooms and clearly have to pee upon exiting the plane. So I believe in checking my luggage. 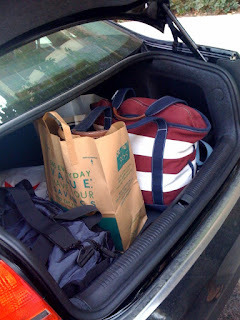 I also believe that I can pack as much as I want, as long as I can carry it unassisted. 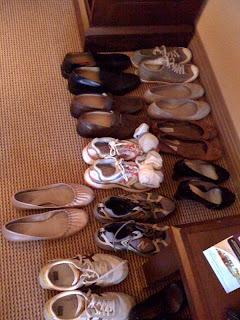 Those were our shoes for the trip. Yep, that's how many shoes we brought for a Friday afternoon-Monday morning trip to NYC! In our defense, we had a wedding to attend with several events, and many outfit changes. We could carry it all, therefore it is acceptable. Which leads me to our concept for a dating show. Give a man and a woman a location. Send them home to pack for a trip for an allotted period of time to the specified location. Ask them to return an hour later. Based on the amount, and items they packed, their compatibility is determined. *People like us who pack in matching suitcases, clothing pressed and folded inside, and with 4 outfits per day, which have a suitcase scale in their bag to ensure they are not over the weight limit. Therein lies the key to our millions. Travel Companions. Maybe that's what we'll call our dating show. It's a brilliant idea. I swear. It's brilliant. She just used it for a recent trip and had a great experience and got a great deal!